I love films like this, films with no women characters so no slushy love plots, just lots of nice men being manly and buckling their swashes. Hooray! 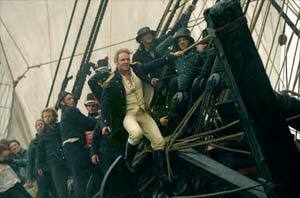 Master and Commander: The Far Side of the World (was it really necessary to make the title quite so unwieldy?) is based on the first two books in Patrick O'Brian's Captain Jack Aubrey series, which I'll admit I've not read but which I might just try now. As often happens in films based on books, the plot is fairly episodic, leaving a nice big opening for a sequel at the end, and the characterisation is perhaps a little more subtle than your average action film. 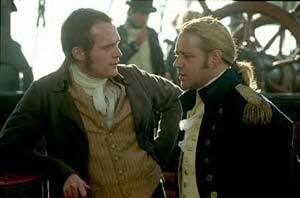 Russell Crowe is clearly having the time of his life as 'Lucky' Jack, Captain of the HMS Surprise, tempering scowling authority and military ruthlessness with rousing speeches and a nice and unexpected line in crap jokes. However, I'm not sure he suits long hair. Paul Bettany, however, threatens to do to Crowe what he did to poor old Heath Ledger in A Knight's Tale, namely act him off the screen. Perfectly cast as Aubrey's friend and ship's surgeon Stephen Maturin, he is the thinking woman's totty: surgeon, scholar, naturalist and all round decent humanist, and the scenes in which he gets to explore the Galapagos islands fifty years before Darwin set foot there are beautifully done. Also on board we have POW star James D'Arcy, whose gentle, floppy-haired good looks are completely wrong for the 21st century but perfectly suited to period drama, and who is well cast as Aubrey's right hand man, 1st Lieutenant Tom Pullings. Pippin the Hobbit (aka Billy Boyd) loses his Scots accent to say 'Aye aye Cap'n' and 'South by sou-west, Cap'n' a lot; Max Pirkis as the young Midshipman Blakeney is just the right side of irritating, even if he does look and sound suspiciously like Oliver Twist, whilst the ever-reliable David Threlfall makes a splendid ship's cook, sporting enormous sideburns that cause him to bear more than a passing resemblance to Noddy Holder. In fact quite a few of the Able Seaman look as if they'd been press-ganged in from '70s boy bands (that or the cast of Velvet Goldmine), all rosy cheeks, flowing locks and clean cut good looks (perhaps a bit too clean cut but we'll let that pass). Perhaps the real stars of the show, though, are the ships, which look amazing, regardless of whether they're sailing calm seas or devastated by terrifyingly realistic looking storms. Although you could complain that some of the sailors are a bit too clean and good-looking, not to mention far too polite, and there aren't nearly enough tattoos, the film conveys perfectly the stifling claustrophobia below decks, the terrible dangers above and the heart-lifting freedom of ploughing through the open ocean towards new destinations. Whilst several features of the film point to a Hollywood megabuck movie - the huge budget, strong, manly hero and exciting action scenes (and some of the combat scenes are genuinely thrilling) - this is not a historic blockbuster in the style of Gladiator or Titanic. For starters, it's actually fairly adult and intelligent - clearly far too intelligent for the kids in the front row of the cinema, who were eventually evicted for making too much noise - and the action appears to be entirely real, with no obvious in-your-face CGI trickery. The plot is pretty superficial, and instead we're treated to a slice of life on board a naval vessel that is as fascinating as it is enthralling (oh, and occasionally gruesome - those of a squeamish nature be warned).